2 Bedroom, 2 Bath duplex with a full sized kitchen, matching appliances, large counter with seating. Living room features a large fireplace, high cathedral ceilings and southern exposure windows, large couch facing fireplace and TV, VCR/DVD. 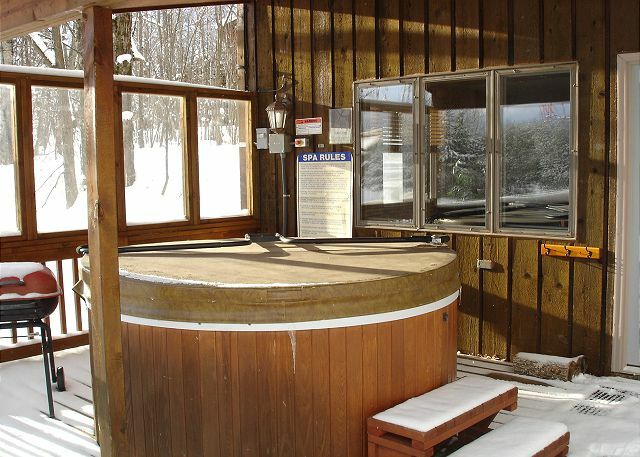 Large indoor ski storage, picnic tables, sauna, Large outdoor hot tubs with adjoining interior doors to accomodate larger groups renting both sides. Trailside access to Alpen Trail and Lift 1. I have so many friends that want to go to big powderhorn for vacation that I have to rent out both sides of this cabin. We stayed at this property for several months from the spring into the winter and enjoyed ourselves. This well-maintained property has a fully supplied kitchen and it a great place to cook, relax, or look out the large windows. We stayed for a long period and felt very at home. The view out of the large windows is beautiful and calm. We saw deer in the back yard frequently. This was a great three-night stay (Arrive Thurs; Depart Sun). Excellent amenities and we had lots of fun. The ski-in/ski-out location worked out well. At one point two people from our group were not skiing, so the skiing people met them at the Alpen Inn for lunch. Skier skied there; the others just took the short walk across the road to meet up. The home was very clean and ready to go. Small signs about using the fireplace, sauna, etc. helped to maximize enjoyment and represented experience in having folks stay there. Even our most fussy group members were happy with the condition and cleanliness. The management staff was most helpful as they answered all questions on the phone in advance of our visit. Someone came by every day to check the hot tub. Very attentive. quaint and fun place. Great for ski in and ski out. We rented out both sides and couldn't have had a better time. Having two of everything was key. We enjoyed the ski in/out and the close proximity to the Alpen Inn. The live music there on the weekend is great and is only 100 yards from cabin. We are looking forward to another weekend to stay here again next year. We had a great time this winter. It was easy for everyone to ski in and out. Everything we needed was provided. Very clean! For the second year in a row, Stonehedge 2 and the staff at Big Powderhorn Lodging provided a great weekend for my friends and I. We had a couple of days on the slopes and took advantage of the great ski in/ski out backyard before the near record breaking cold temperatures kept us inside. The cabin was in great shape and the fireplace and bathrooms looked nice after being redone since our last stay. We look forward to our next trip to a Big Powderhorn Lodging location. I would give a 5 on all accounts above. The beds were comfortable. The house was clean. The hot tub was clean and well maintained. Great family weekend end. The only complaint I have is the 3 night minimum stay. It appears to me that many of the trail side units sit empty on weekends because of the 3 night minimum stay. I find this ridiculous. This is a weekend destination. Our group had a great time at Stonehedge 2. We loved the convenience of the Alpen slope in our backyard. The duplex was perfect for our 10 guests to have a comfortable and fun weekend, and it was nice to be able to walk to the Alpen Inn across the road if we wanted. The hot tub and fire place definitely got plenty of use. We look forward to coming back next winter! We had a great stay - the place was great - clean, roomy and well-stocked. Unrelated to the chalet itself...which was ski in/ski out - the run was not open and that was a big bummer. I'm sure we paid a little more to have that privilege, but it didn't work out. I do believe we'd go back there, but maybe later in the season when we're assured that all the runs will be open. Thanks for the great lodging! This is really a nice place and great ski in/out. Really liked the fireplace, hot tub & sauna. It has a good size kitchen and rooms. Spiral staircase is a bit chanllenging with kitchen supplies and loft on 3rd level is open so if you have kids up there it's tough to get them to sleep if you're still up (that's our problem). Great size & price for 2 families. The location was great. The amenities were a wonderful addition. The fully equiped kitchen was great. We had an awesome time at Stonehedge. Ski in/Ski out has spoiled us. The unit is nice, well stocked and perfect for a ski vacation. We will be back. Also the snow was perfect. This cabin has a 40 foot living room ceiling with a spiral staircase down from the bedrooms to the kitchen. It slept ten of us with two on the pullout couch (new brown leather!). Just be sure to keep the fireplace going since a little air leaks from the air conditioner but this is not a problem. 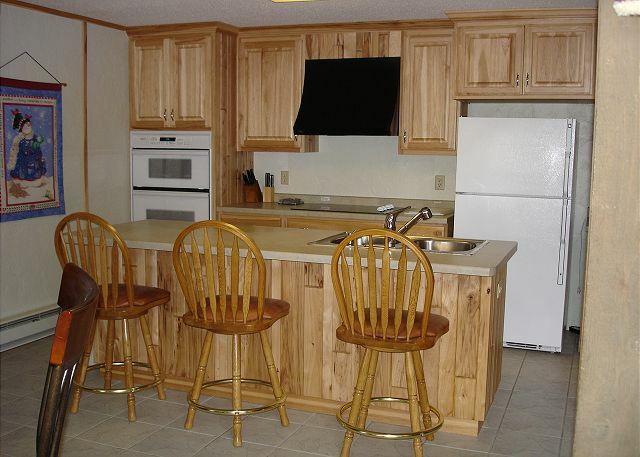 Plenty of space to eat and cook with a new stove/microwave/oven/pizza cooker/coffee maker. I would recommend this stay to anyone who is looking for convenience and luxury. Don't forget the hot tub!!! This was the perfect ski getaway. It is located directly on the slopes and when they say ski in/out, they mean it. There is no walking involved in getting to the hill. Hot tub and sauna made this a very enjoyable place to stay. We enjoyed every part for our stay except for the lack of real snow. The hill did a great job in putting down man made snow and grooming. Great place and location - right on the hill. kids loved it. kitchen has every utencil you could think of if you like to cook at the house. Sauna and hot tub are very clean and in perfect shape. nice woodburning fireplace - right across street from Alpen Inn which is 90 steps over and 120 back. Met the owners - wonderful people who left the place like they lived in it. 7 of us had plenty of room. Great place to rent with families.